How frustrating it is when you just can’t find the file! 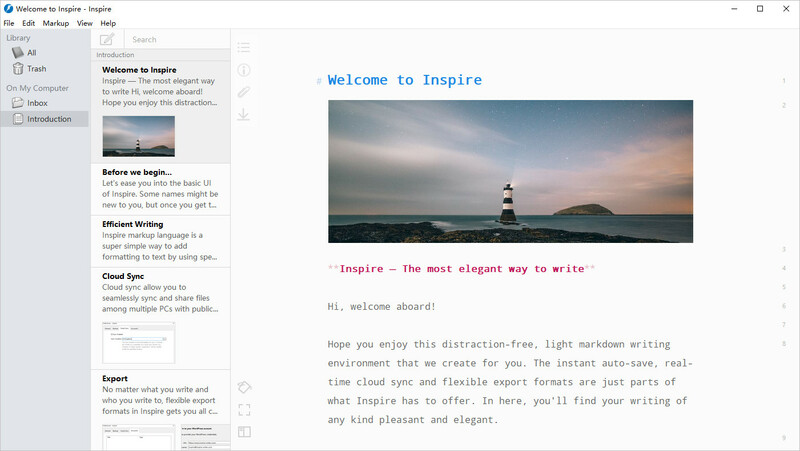 Inspire organizes and manages all your work in a unified library, be it simple notes, school essays, or daily blog posts, just with an easy search, and voilà, there’s your work. All there’s left for you to do is to focus, and write. Inspire automatically saves your work when you’re writing, so your file will never get lost out of the blue, or even deleted by accident: You can always restore it. Unless, of course, you erase it yourself. It also lets you sync among multiple PCs seamlessly with the help from cloud services such as Google Drive, Dropbox and OneDrive. You can by all means see the syncing feature an update to the auto-save and backup.